“My mission is to create new possibilities that inspire and empower others,” says designer and home stager Debra Gould, of Toronto-based Six Elements Inc. Serving clients throughout Canada and the US. Six Elements creates new possibilities for you— because of the money-making power of real estate when it is combined with home staging, and the transformational effect of living in a home that is decorated and arranged to suit your lifestyle. We are not real estate agents and we are not interior designers. As home stagers, we do not believe in buying things for the sake of having what’s “in” this year because we’ve seen too many homeowners buried in “stuff” they don’t need and don’t like. Six Elements Inc. offers a range of services to help you no matter where you live. Home Staging (or House Fluffing as it’s also called) helps your home sell more quickly and for more money whether you are in a slow or hot real estate market, because when you decorate or stage a home to appeal to potential buyers, you have a hotter property to sell. In a slow real estate market where prices may be going down and new competition is coming onto the market every day, time is money to you as a home seller. You can’t afford to miss the season and have your home sit on the market for 6 months or more. Plus there’s the “opportunity cost” of hanging onto a home longer than you want to. Opportunity cost includes the tangible things like mortgage costs, property tax and insurance. But there are intangible costs too; like wasting time commuting to your new job that is farther away, not being able to send your kids to a better school until you move to a different neighborhood, trying to keep your house showing-ready when you’ve got kids and pets and a full-time job, or being stuck in a house with your “ex” while you wait for that sale so you can finally go your separate ways! Using home staging strategies and techniques we have helped clients out of all these situations and more by decorating their homes to sell faster, often saving them from the costly listing price reductions their real estate agent is pushing for. In a hot real estate market where listings tend to sell quickly, home staging still gives you a distinct advantage. Obviously, the more buyers you have competing for your property, the higher the final selling price as each prospective buyer tries to outbid the others. Not everything sells even in a hot market. There are always those properties that seem to languish forgotten month after month. Eventually everyone avoids going to see them, assuming there is something terribly wrong with the house for it not to have sold more quickly. MoneySense says, "If you're looking to score on the real estate market, your best investment may not be a house or condo, but an hour with Debra Gould." Debra Gould’s clients generally sell in days and earn a $10,000 to $70,000 profit on her services by allowing the Six Elements team to transform their homes. Imagine the possibilities such a cash windfall and faster sale could create in your life! We offer in-home staging services in the Toronto area, and virtual staging services across North America, providing you with advice by phone based on photos you provide. Learn more about our home staging / house fluffing services. After watching people lose tens of thousands of dollars because of misinformation or the wrong real estate agent, Debra Gould introduced this service to provide objective advice, unclouded by commission fees. 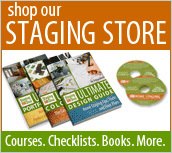 For maximum impact, this service is often combined with a Home Staging by Design™ consultation. Real estate advice is also offered by phone. Learn more about our real estate advice. Imagine, if you could live in a home you felt happy, relaxed and comfortable in. Would it change the way you’re living? Six Elements Rooms by Design™ service helps you focus on what you really want from your home, how you want to live and how you want to feel. We usually use what you already own in new ways, and where appropriate we’ll make recommendations for the right ingredients to add. We don’t believe in homes looking “decorator done” because that often leaves homeowners feeling like they are playing house in a home that belongs to someone else. 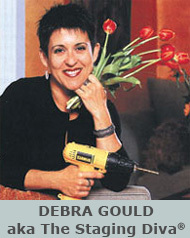 Debra Gould often refers to herself as “providing decorating help for people who would never hire decorators”. Learn more about our interior redesign services. With the right colors, even a simple arrangement of furnishings can be stunning. Are you living with stark white, builders beige or a color you hate because you’re paralyzed by too many choices? Color is the most inexpensive decorating tool, with more impact than anything else. One client was going to rip out a kitchen until Debra showed her how it could be transformed with color— saving at least $30,000 in stressful renovations. Six Elements Color by Design™ process creates a color palette for an entire home in two to three hours and can be combined with an overall interior redesign consultation or home staging consultation. Learn more about our color consulting services. 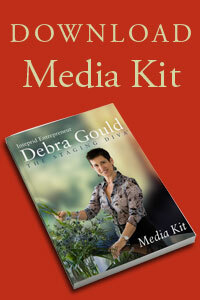 Home staging expert Debra Gould is also known internationally as The Staging Diva®. She has been teaching others how to start and grow a successful home staging business since 2005 and has over 4,000 students worldwide. There is nothing like the joy that comes from making a real difference in your clients’ lives while also earning a living from your creativity and natural talent! 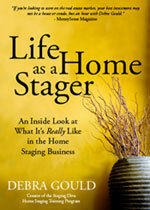 Learn more about how to become a home stager. Let us show you how we can design new possibilities for your home and your life, email or call Debra Gould at 416-691-6615. To learn more about Debra’s training and experience and what lead to the creation of her unique approach, read about us.